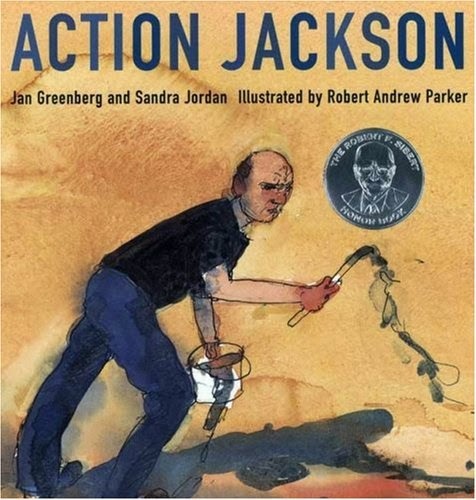 Action Jackson is a pretty good read if you're going to try some drip and splatter painting with students - it tells a fairly straightforward story of Jackson creating one of his large scale abstract paintings on the floor of his old barn on Long Island (and conveniently skips the alcoholism and other less palatable aspects of the artist). Like Pollock, we skipped the gesso and got straight to painting on canvas. It's definitely not a tidy project, but you can keep it pretty under control by taking turns, wearing serious smocks, and working within a contained "paint fort". There's a lot of patience, decision making, and big movements involved in making a big painting together like this! Way different than the small controlled ways we usually paint! Also much like in Jackson's work, a penny or two found it's way into our painting!